The Bus Blog is proud to report that DART has been recognized by none other than the American Public Transportation Association for leading the industry in improving bus safety. DART received the “Gold Award” in the safety category among mid-sized agencies as part of APTA’s 2011 Bus Safety & Security Excellence Awards. The award was presented Sunday evening in Memphis, Tennessee. This is a big deal for DART. Your editor doesn’t need to remind his faithful readers that the image of DART suffered from the string of highly publicized pedestrian accidents a few years ago. It seems that “the accidents” is all some people know about DART, despite the thousands and thousands of miles that DART’s operators safely transport passengers week in and week out. So it was good to receive outside, independent confirmation of the culture shift that has occurred within DART over the past few years. DART implemented more than 50 safety initiatives, including the hiring of a safety manager; an intensified training program that focuses on the fundamentals of safe, defensive driving; tracking all incidents with a strict criteria that judges preventability, not just liability; and recognizing and awarding the safe driving records of DART operators. “Slowly but surely DART has become a national model for just how much can and should be done to make safety the top priority,” General Manager Brad Miller said. The award was earned, not given. Only one “Gold Award” is given each year. Among transit agencies with 4 million to 20 million annual passenger trips, the only two agencies to be recognized were DART and the Southwest Ohio Regional Transit Authority (Cincinnati). DART congratulates SORTA on receiving a Certificate of Merit. To qualify, DART not only had to show innovation in improving bus safety, but also demonstrate that the changes led to measurable results. Those results? 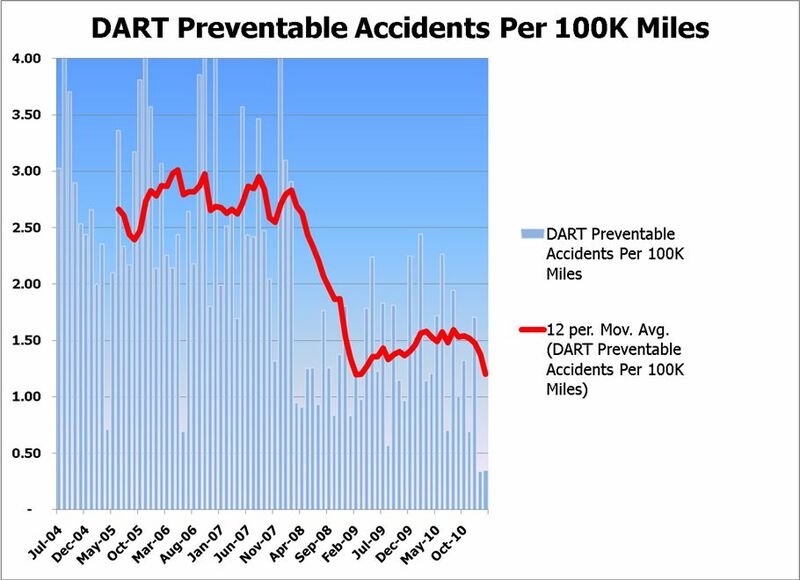 DART’s “accident frequency rate” has decreased from 3.47 per 100,000 miles as of August 2007, to 1.02 per 100,000 miles so far in the current fiscal year. “Accident” is defined very strictly here, to include even the most minor incidents that could have been avoided. It should go without saying that the work at DART to improve safety is not done, and never will be. johnpemble: @kbucktak I’m on a bus now? Wow. And it nearly hit you? One of these things isn’t a surprise. Which one? kbuchtak: @johnpemble Given DART’s safety record, I’d say the answer is clear, no? johnpemble: @kbucktak I’m more surprised that my image, should it appear in public ads, would be on an object of such notoriety. Why wouldn’t it? DART’s social media team responded to the first Tweet, without passing judgment on the validity of the claim. ridedart: @kbucktak Safety is top priority at DART. So if there was an incident we should look into, we would like to hear about it. 283-8100. The team did not, however, respond to the insinuations about DART’s safety record. How do you challenge assumptions in 140 characters without sounding totally defensive? There is no denying the highly publicized rash of pedestrian accidents between 2007 and 2009, some of which were deemed DART’s fault, others not. But they can and should be put into context. For starters, DART’s drivers put on some 10 million miles in that time, and have driven millions more since then. More importantly, DART responded by implementing more than 60 new safety initiatives, including increased operator training and stricter hiring and firing policies. The most objective measure of a transit agency’s safety record is “preventable accidents per 100,000 miles,” and DART’s rate has been roughly halved in recent years. 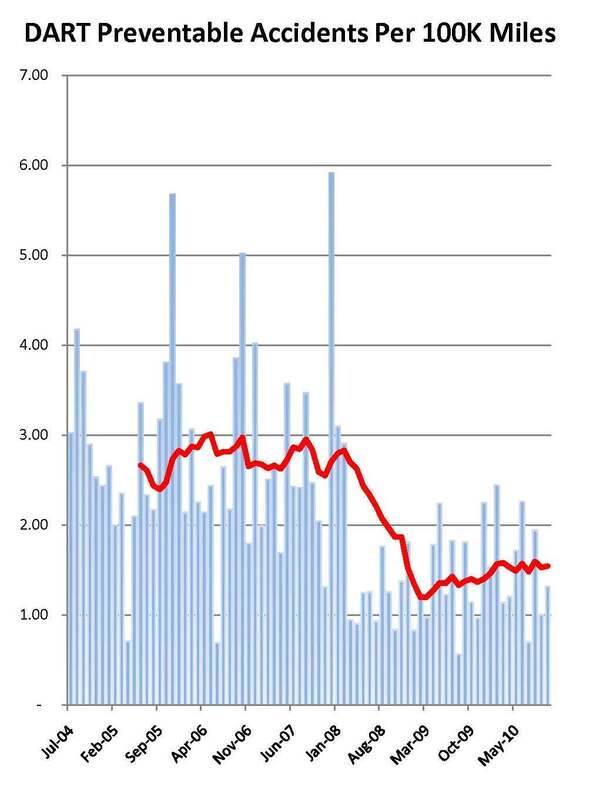 You can see the trend line in the chart below, which was prepared by General Manager Brad Miller. For the record, DART’s transportation and paratransit managers have a strict interpretation of what constitutes a “preventable accident”; it includes any fender bender, even banging a mirror on the side of the bus garage. To them, it is more important to reinforce a culture of safety than to post artificially low numbers.